Hi everyone! 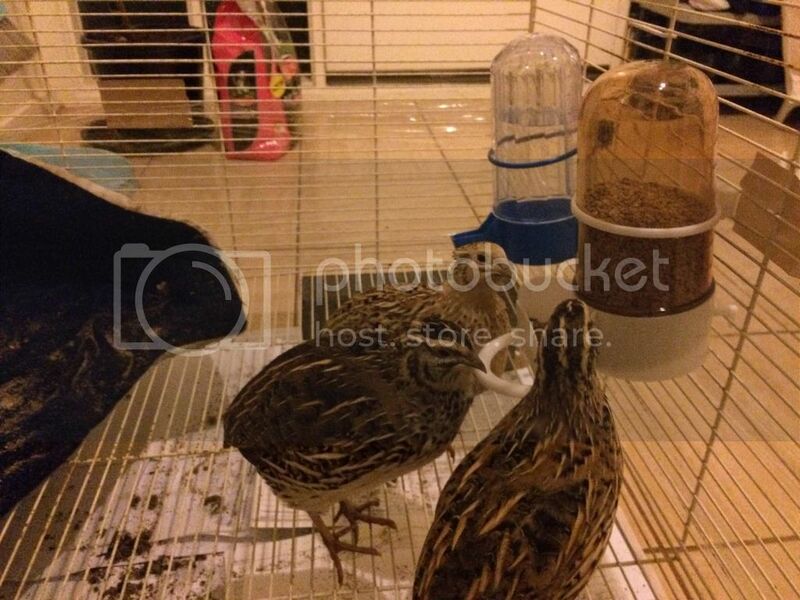 I got 4 female Japanese quails 3 days ago and this is my first time keeping quails. I wanted to make sure I'm going in the right direction with these birds so I'm going to dump a lot of detail in this post and it might end up quite long! Your advice is much appreciated. Thanks! Grit/calcium supplement and velvet mattress, corner of dust bath. 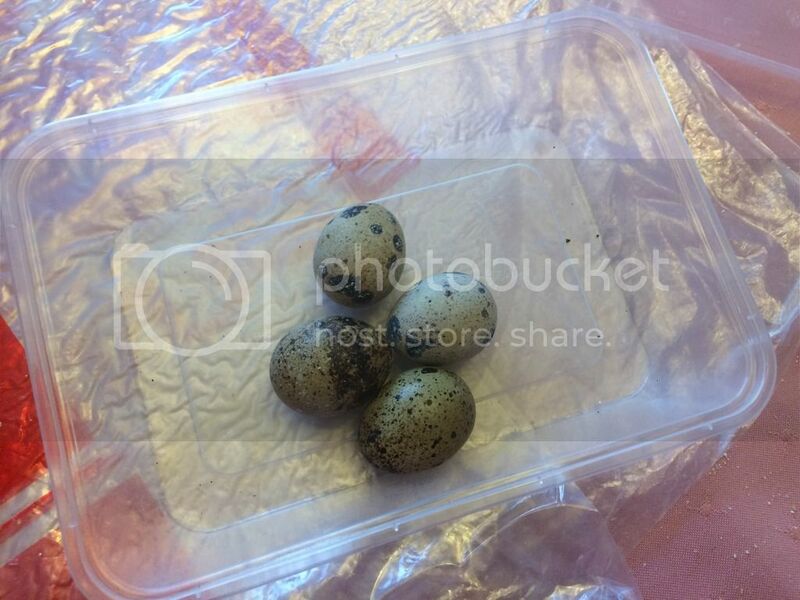 Some quail eggs collected over the last 3 days. As you can see I have a dust bath (it's just sand/dirt from an old sandbox in my backyard), fountain feeders for water and feed that I got from the breeder, a home-made plastic bottle feeder with grit, and a blue velvet thing that was my dog's old mattress for them to stand on. They like to lay their eggs on this blue velvet thing. The cage is an old cockatiel's cage that I turned on its back so the sliding doors are on top and the quails have more room to walk around in. It's elevated slightly off the floor with some bricks in each corner so the poo drops to the newspaper below. I bought some game bird feed today (Laucke Gamebird Finisher MP with 22% protein) that I haven't yet transitioned the birds to. If memory serves correct, the breeder said something about needing to give them adult food because he might still have been giving them growing food. The birds are apparently March/April babies so they should be old enough to lay now. I am quite certain they are all girls from the dots on their chests. Anyhoo, I've got some concerns/questions so if you could help me out that'd be great! Since I got them, I've only gotten 5 eggs (about 1 or 2 a day). They're laid at random times. Are they not all laying because of food? Are they not settled in yet to a new home? Is it the light (I heard 16 hours a day of light is good)? What about calcium? I don't even know who is laying and who isn't! Should I separate them to see? Speaking of calcium, I have been giving them boiled crushed eggshells. I bought some grit for finches today that I've put in their cage. It contains oyster shell, baked eggshells, limestone, and charcoal among other things. Is this okay for them as a calcium supplement? Some of the eggs are chalky and lumpy, while others are smooth and glossy. Why is this? Do I need a run for them? I am planning on keeping them in their cage the whole time, but when spring/summer comes I want to move their cage during the day onto my lawn so they can peck at the grass, dirt and bugs. Is this okay? I read that quails like shelter and places to hide to feel more comfortable. 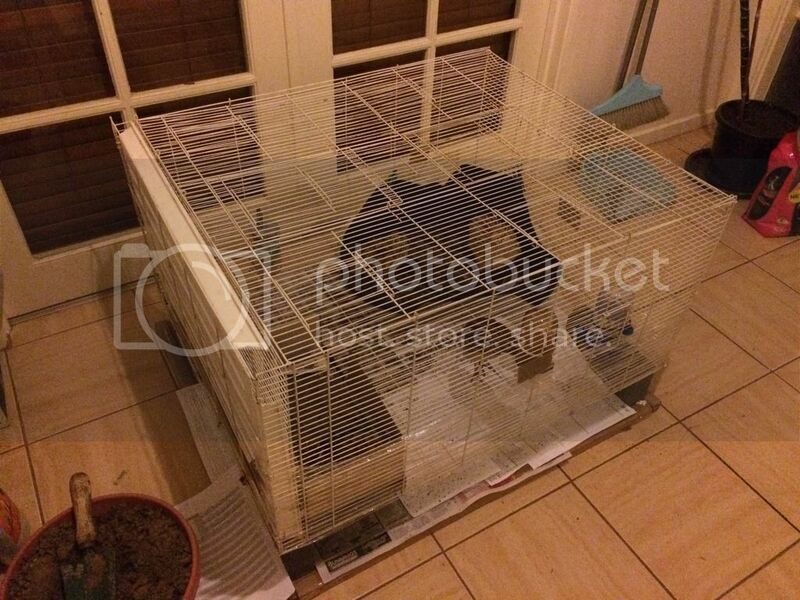 I don't have any decor in my cage and I'm at a loss of what to put in there. Ideas? Just wanting to confirm that without a boy they can still lay eggs right? The breeder wanted to sell me a boy and told me they won't lay without a boy but I read that's not true. How do I keep the smell down? I'm not going to consider deep litter because the cage they have is going to be their home (I'm too stingy to get them a new enclosure). What substrate is good to absorb the poo? When I move them outside when the weather gets warmer, will it attract flies/pests? How can I prevent this? Thanks so much for your patience of going through this and for answering. I may update with newer photos/questions later. I won't attempt to answer any questions about quail but there are plenty of others with experience, however re a good litter, by far my preferred (and I've tried them all under inside chicks) is Proteq -a sawdust product which is reconstituted with water - to use as a litter at this time of the year you will need to add water and allow it to dry out (best done in a small quantity at a time and dried inside. In the Summer it dries quickly in the sun). You can buy this at Brindabella Stock Feed in Hume. 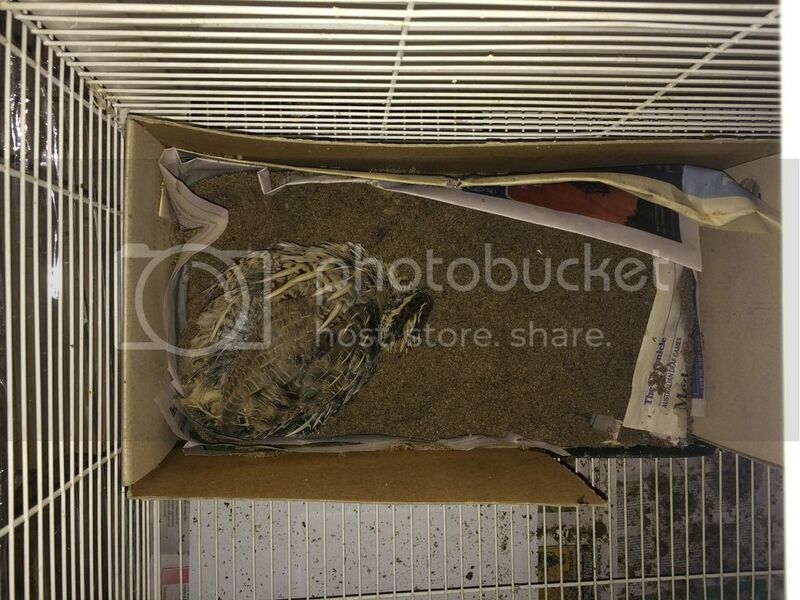 I've been raising quails for a few years now and have to say that they are easy keepers! When they first start laying at 6 weeks they will lay irregularly. It gets better shortly. They also lay less in winter as they do need the light to regulate their hormones. I give mine ground oyster shell from the feed store for calcium. It's what my mom used decades ago, and my birds have always been healthy on it. Your birds will love their outside time. I have mine in a run and they are happy little campers. They have a variety of shelters as well as a hen house where their food is located. We have two half barrels on brick bases, a piece of corrugated roofing iron my hubby made into a tunnel, another one that's just leaning on bricks and a last one that's a half round. Let's just say they are a bit spoiled for choice, but with roughly 35 little guys running around it keeps them out of trouble. I also give them piles of grass when i mow the lawn. They love to dig in it and search for bugs etc. Then they make beds and lay around in it. On a side note, I sometimes splurge or and buy a container of meal worms for my flock. I feed them out over several days. It's great for upping their protein and providing them with a bit of fun. They're keen hunters and will chase whatever is interesting and moves! When i have chicks i sometimes get them little crickets which they love. I raise them in a brood box and the crickets can't escape. They hunt and chase and it again gives them some fun. Yes, your girls will be fine without a boy. If you do decide to get a male, stick to one as they are territorial and will fight. They have a beautiful little call, and we've named our farm after that sound. It's called Wikkitiwah Farm. It's the closest we could come to describing the call. We have about 4 males on hand, but we have a run that's 6 meters by 10 meters so they can stay out of each others way. We did have an unfortunate quail death due to competition early on before we knew better. It was very upsetting. The males will fight to the death as they are that competitive. Unless you want fertile eggs, stick to the girls. 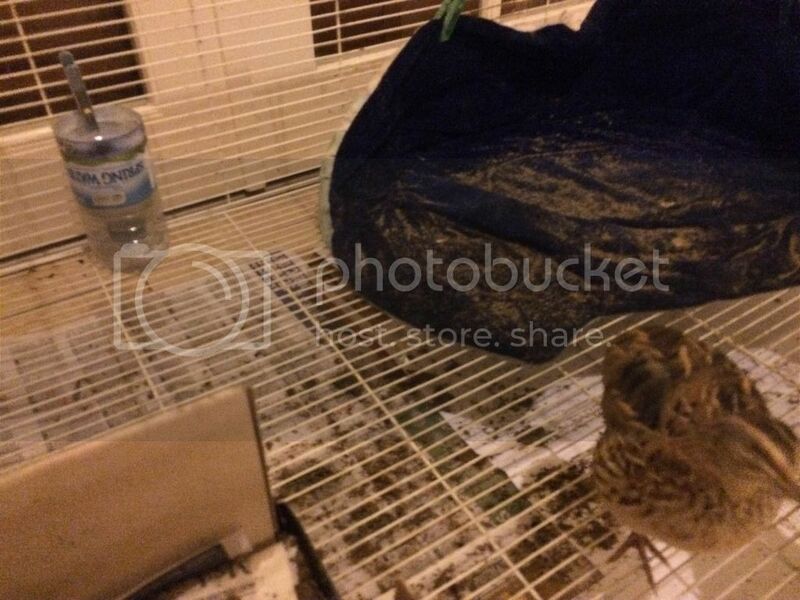 Don't worry about your quails too much. Give them lots of fresh water, the game bird food is great, and they love to eat fresh grass and bugs. Just watch our for neighborhood predators like the local dogs, cats and foxes. They may try to break into the cage if given a chance. We have a problem with neighborhood dogs that are not restrained. Our cage is extended out under ground so they can't dig in although they have been trying! You could put a branch with some leaves on it in the cage. They will love to hide in the leaves. They love their dust baths, and you've got that covered! Change things around for them to keep them from getting bored and just try things out to see what works. They're hardy little birds. Enjoy them, and their beautiful eggs! My quails have stopped laying eggs for about 3 weeks now! I have no idea why they suddenly stopped laying! Please if someone could help me (more details at: viewtopic.php?f=24&t=8039304) as my family wants to cull these birds.